It has been a good year. The robin harvest was plentiful. Yes, it’s true. We have moved out of our cave and into what we hope is the lucrative world of robin farming. During our time in the cave, which we now refer to as our “dark period”, we developed a taste for what we’ve coined as “The Other Red-Breasted Meat®”. Naturally, our newfound appetite for robin meat and their delicious blue eggs prompted the urge to uproot the family and implement another radical lifestyle change. Because we still didn’t have a car, we decided to venture out on foot to find a place to start our new life breeding birds. We came across an abandoned farm just a few miles down the road from the cave. 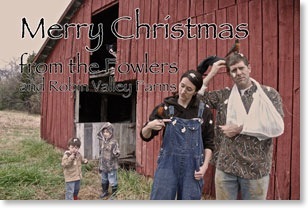 As far as we know, we’re the only squatters running a working robin farm in the county. Miles had actually spent a few weeks on the farm when he had wandered away from the cave in 2011 and was a great help in showing us around as we settled into our squat. 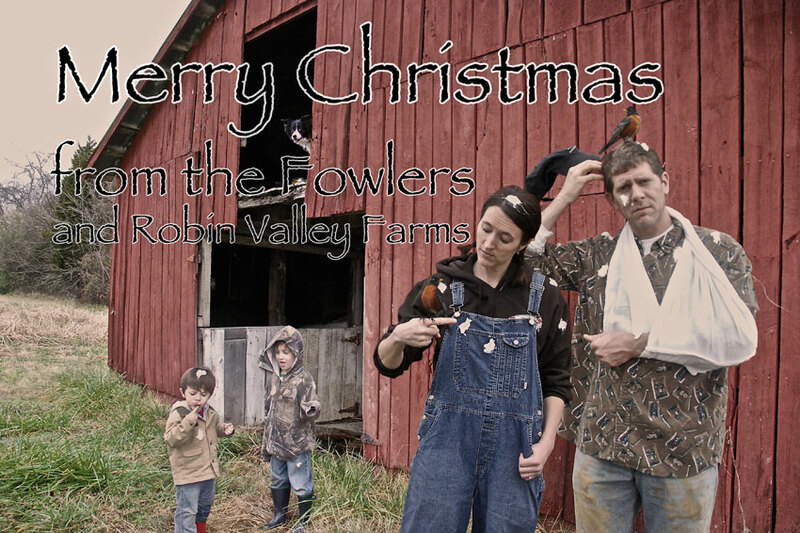 Believe it or not, working a fully operational robin farm is as glamorous as it sounds. After a peaceful night resting our heads on our homemade robin-down pillows, we start the day bright and early with a 50 egg omelette for the family to share. Honestly, these eggs are so delicious that even Sara’s cooking can’t ruin them. However, gathering that many takes quite a while. So by the time we’re done with all the preparations and cooking, it’s time for lunch. A quick siesta after lunch and then we’re able to start the farm chores at 4pm. If you think life on a farm is a piece of cake, think again. Lonnie broke his arm getting out of the siesta hammock just a few weeks ago and Sara has had to take on double duty planting worms. Now this is in addition to letting the birds out to pasture which is actually quite complicated. She opens the gate and the robins fly out for the day. Then when our workday ends at 4:30, she opens the gate and the birds return. Or not. We hate to grouse, but it has been tough to find an insurance company that can actually insure the losses for our 90% “fly-away” rate. Well, these robins aren’t going to farm themselves and we’ve got a busy schedule to keep - it’s almost time for our siesta. The robin is a wonderful animal and we wish that you all lived close enough so that we could invite you into the warmth of our home and give you all the bird in person. • We took this picture at a barn behind a friend's house. We had no idea where we were going to take the picture when we got in the car that day. We just headed outside the city limits and ended up there. It worked out great. • This idea was the fourth one on our list for this year. Some earlier ideas were proving to be too hard to implement and to find the necessary props and clothing at local goodwill stores. • The "ice cream from heaven" is greek yogurt and Miles was so excited to have some put in his hair. • The final photo is made up of 5 separate shots, all taken from the tripod and then combined in Photoshop.